The recent discovery of what may be three new frog species by researchers in Panama illustrates the hope and fear encountered daily by the Panama Amphibian Rescue and Conservation Project. The discoveries lead to hope that project researchers can save these animals from a deadly fungus killing frogs worldwide and the fear that many species will go extinct before scientists even know they exist. Nearly one-third of all amphibian species globally are at the risk of going extinct. The rescue project aims to save more than 20 species of frogs in Panama, which is one of the world’s last strongholds for amphibian biodiversity. While the global amphibian crisis is the result of habitat loss, climate change and pollution, the deadly amphibian chytrid fungus is likely at least partly responsible for the disappearances of 94 of the 120 frog species that are thought to have gone extinct since 1980. Although it can take years to determine that a species is new to science, project researchers have identified some telltale signs indicating that the three species found in eastern Panama are, indeed, new. 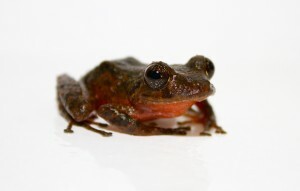 The first two are rain frogs from the genus Pristimantis. One of these species has a bright red stomach that is uncharacteristic for rain frogs, earning it the nickname “red tomato.” The second species is much larger than any known Pristimantis in the region. 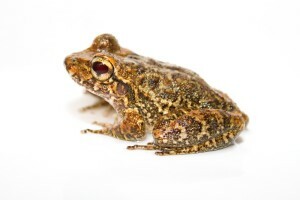 The third frog species appears to be a robber frog, genus Craugastor, but unique skin folds on its arms and feet distinguish it from other closely related species. Robber frogs are especially susceptible to chytrid. A new study by Andrew Crawford, a STRI research associate, and colleagues reveals that many frog species at a site in western Panama have gone extinct before researchers knew they existed. The project’s three potentially new species are evidence of the same story playing out right now in the mountains of eastern Panama. Researchers have brought a handful of animals of each species back to the Summit Municipal Park in Panama City, Panama, where the project has turned used shipping containers into amphibian rescue pods. Now project scientists will use collections of frogs from the same region at the Smithsonian’s Natural History Museum and elsewhere to determine if these species are genuinely new or if they have already been discovered (or “described”) elsewhere. The project has also collected tissue sample to use DNA testing to map out the animals’ closest genetic relatives. The mission of the Panama Amphibian Rescue and Conservation Project is to rescue amphibian species that are in extreme danger of extinction throughout Panama. The project’s efforts and expertise are focused on establishing assurance colonies and developing methodologies to reduce the impact of the amphibian chytrid fungus so that one day captive amphibians may be re-introduced to the wild. Project participants include Africam Safari, Autoridad Nacional del Ambiente, Cheyenne Mountain Zoo, Defenders of Wildlife, El Valle Amphibian Conservation Center, Houston Zoo, Smithsonian’s National Zoological Park, Smithsonian Tropical Research Institute, Summit Municipal Park and Zoo New England. This entry was posted in biodiversity, chytridiomycosis, ex-situ conservation, Extinction, Partner project, Rescue, why frogs matter by Lindsay. Bookmark the permalink.